Preheat the oven to 400. Line a baking sheet with parchment paper and set aside (I used a 10 x 15” baking sheet). Slice the apples open and remove the core. Cut the apples into thin slices (about ¼” thick). Toss lightly with the lemon juice and set aside. Lightly flour your workspace surface and unfold the thawed puff pastry sheet onto the floured space. Using a lightly floured rolling pin, roll the pastry sheet out to be a 10” x 14” rectangle. Place the pastry rectangle onto the prepared baking sheet and refrigerate for 10 minutes. In a small dish, combine one tablespoon of the sugar with the teaspoon of flour and stir. In a separate small bowl, combine the remaining 3 tablespoons of sugar, the cinnamon, the nutmeg and the allspice. Mix until combined. Leaving about 1/2” around the edges, sprinkle the flour mixture across the surface of the pastry rectangle. Line the apple slices onto the pastry in three long rows, overlapping the slices. Sprinkle the cinnamon-sugar mixture evenly over the top of the apple slices. 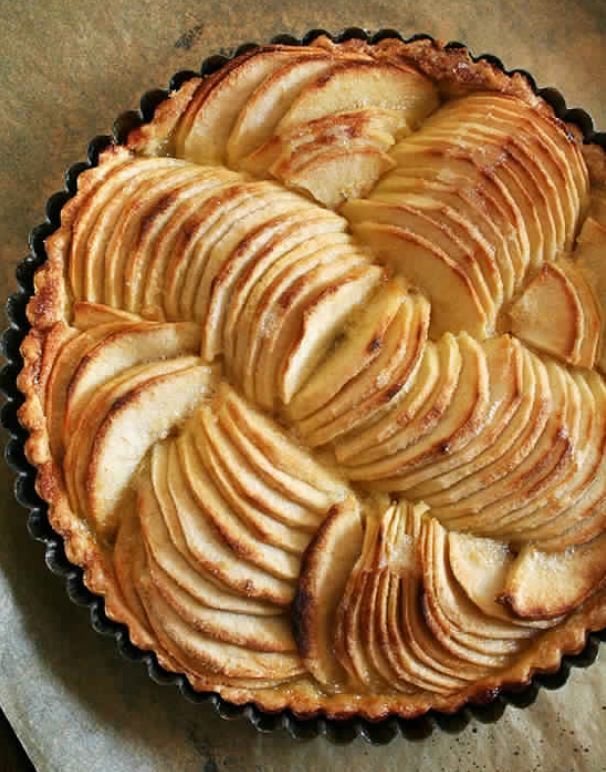 Bake for about 35 minutes or until the edges are browned and the apple are cooked through and tender. Let the tart cool for a few minutes. Cut tart into 12 equal pieces (I used a pizza cutter to slice lengthwise between each row of apples to form three long sections and then I just cut each of those into four equal pieces) and serve.